Bruce Smith visited Rome about 20 years ago. Now he can spend seven weeks in the Eternal City, known for its abundant ancient buildings and artifacts; exquisite art; and dramatic history. Smith, a critically acclaimed poet and professor of English in the College of Arts and Sciences, has been named a Rome Prize Fellow at the American Academy in Rome (AAR). In discussing his award, Smith quoted Lord Byron, the English poet who lived in Rome in 1817. Smith has not confirmed when he will visit Rome; the award lets him choose a time before May 2018. He will work on a project of his choosing. Smith will also have access to the academy’s library, special access to historic sites and walks through Rome’s streets with scholars. The AAR was founded in 1894 and is the United States’ oldest overseas school for independent research. Smith will be among 30 fellows AAR hosts each year in disciplines including ancient, medieval, Renaissance and modern studies; and the visual arts, literature, musical composition, historic preservation, architecture and design. He was chosen from 800 applicants. Recent AAR residents have included Toni Morrison, novelist and editor; Stephen Greenblatt, literary critic and Pulitzer Prize-winning author; George Lewis, composer and trombone player; and Carrie Mae Weems, a visual artist and photographer who lives in Syracuse. 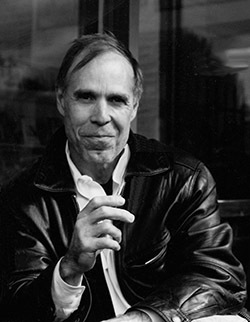 In 2012, Smith won the William Carlos Williams Award, presented by the Poetry Society of America for his latest book, “Devotions” (University of Chicago Press, 2011). He was also a finalist for the National Book Award (NBA), the National Book Critics Circle Award and the Los Angeles Times Book Prize for the same book. Smith is the author of five other volumes of poetry, including “The Other Lover” (University of Chicago Press, 2000), which was a finalist for both the NBA and Pulitzer Prize. Smith attended Bucknell University, where he earned an M.A. in English and worked at the federal penitentiary in Lewisburg. He has taught at Tufts, Boston and Harvard universities, on the West Coast at Portland State and Lewis & Clark College, and at University of Alabama before coming to Syracuse in 2002. He has been a fellow at the Fine Arts Work Center and won the Discovery/The Nation prize. In 2000, he was a Guggenheim fellow and has twice been a recipient of fellowships from the National Endowment of the Arts. In 2010, he received an award in literature from the American Academy of Arts and Letters. Smith says he’s delighted by the AAR award. ”You are selected for the award by the ACR, and that feels like a deep wish granted by someone with a wand,” he says.